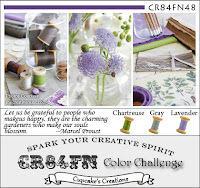 I used a Basic Grey card base, which I layered with Wisteria Wonder and a piece of Very Vanilla. The Vanilla card has been masked with some post it notes, and stamped with the floral image from Elements of Style and coloured using the Wisteria Wonder, and Lucky Limeade ink pads. I then drew some thin lines using the pen tip of the Basic Grey Stampin' Write Marker and a ruler. The sentiment is from an unknown stamp set, and was stamped using Lucky Limeade. The hummingbird was stamped a few times on the vanilla, with out re-inking to get a faded appearance, then I stamped one separately and cut it out and attached it using dimensionals. I added a few rhinestones, and finished off this card. Jess, this is so pretty! I love the colors and I love how you created motion on the hummingbird. So glad you joined us at Freshly Made Sketches! Beautiful in every way! Lovely colors - worked perfectly with your images and the sketch~! Its lovely Jess. I especially like the way the bird image fades out.. Your a very talented lady! Oh my goodness! That is simply gorgeous!! Love the motion stamping you did. Gives his wings a pretty little flutter. That card is just stunning, great take on the sketch and inspiration pic! Soft and lovely Jess, what a pretty hummingbird!! This is gorgeous Jess, way to go girl!!! I love the colour and style and layout, so pretty! So lovely. I love how you stamped the bird in flight. Thanks for joining us at Freshly Made Sketches! So gorgeous ... and stunning colours too! Thanks for joining us at Freshly Made Sketches!!! Love the gray and wisteria together! Elements of Style just worked perfectly for this one. Thanks for joining us at Freshly Made Sketches. Lovely card Jess! That set is a favourite of mine! Lovely colors and such a creative layout with the hummingbird. Jess, LOVE how you made the hummingbird appear to be moving! Pretty flowery paper, too! AWESOME card! THX for playing with us at CR84FN!